Students walk over Stockton's seal in Galloway Township. 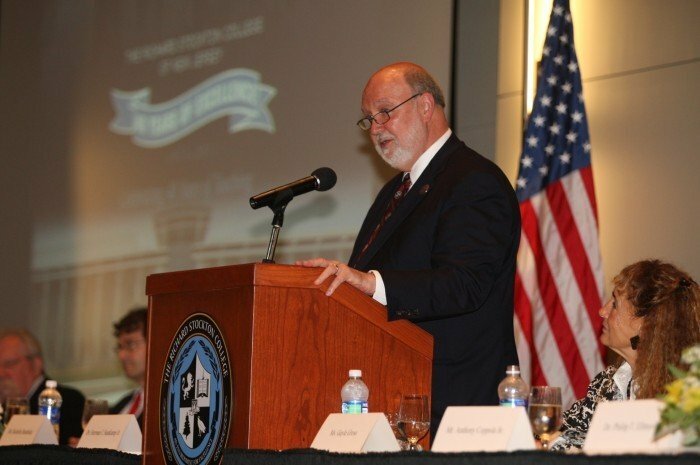 Richard Stockton College President Herman J. Saatkamp Jr. speaks Wednesday during the college's 40th anniversary celebration, during which he announced the kickoff of the public portion of a $20 million capital campaign. Richard Stockton College will officially become Stockton University on Wednesday. President Herman Saatkamp said Sunday he was notified Friday that the state college Presidents' Council, and Secretary of Higher Education Rochelle Hendricks, had both approved the change. The college Board of Trustees will formally approve a new college seal at its board meeting Wednesday and a campus wide celebration will be held at 5 p.m. Wednesday in the Campus Center. Saatkamp said graduates in May will get a diploma from Stockton University. The Presidents' Council was originally scheduled to address the issue at its January meeting, which was canceled by snow. Saatkamp said he had wondered how long that might delay the change, but the executive board met Friday, approved the change, and Hendricks also signed off on it Friday afternoon. The college posted an invitation to Wednesday's event on its Facebook page. Saatkamp said they have already begun preparing new signage and logos. He said the website will be changed Wednesday after the board meeting and signage will be done gradually. Stockton University could have a second site at the Jersey Shore this year. Some employers conduct their job interviews over lunch or dinner, a process that can cause heartburn for many applicants.